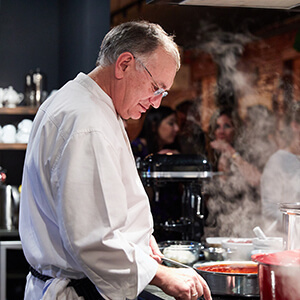 Farm flavor goes over great in the big city, as we learned with Certified Master Chef Ron DeSantis and chef / cookbook author Amy Thielen in New York City this fall. 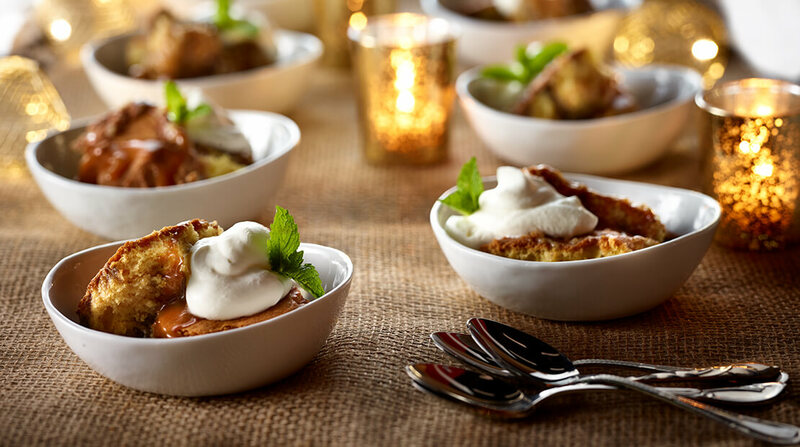 To start the wheels of holiday inspiration turning for all our friends, here are our favorite Farm Flavor ideas from the chefs to try at home. Maybe you’re used to throwing babyback ribs on the grill in the summer, but using Chef Amy’s savory spice mix as a dry rub turned this classic pork cut into a taste for all seasons. Roast and serve as appetizer portions, or dish up the whole rack for a main course. Rub the babyback ribs with the Midwestern Spice Mix and refrigerate. Heat oven to 325°F. In heavy covered roaster, roast ribs 1 hour. Uncover. Roast 1 hour or until very tender, basing with the fat in the pan. 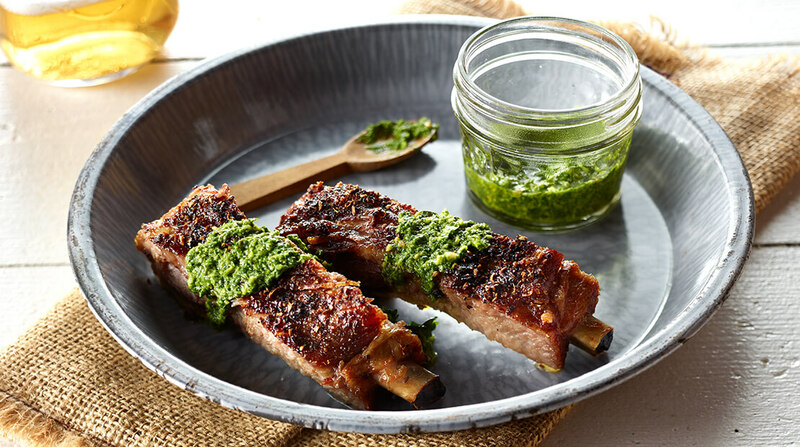 To serve, cut ribs into portions and serve with Cilantro Pesto. Serves 4 to 6. In small bowl, combine coriander seed, black peppercorns, salt, garlic powder, fenugreek, cumin, fennel and red pepperflakes until well blended. In blender, combine cilantro, mint, garlic, ginger root, jalapeno, peanuts, lime juice and oil. Blend until smooth. Bored with cran in a can? 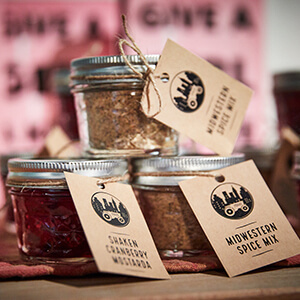 Get next-level home gourmet with Shaken Cranberry Mostarda. Mostarda is a candied fruit condiment with a peppery zing of mustard seed. It is an Old World Italian way to prepare cranberry, and will be popular with people who prefer homemade cranberry side dishes to sweet canned cran. 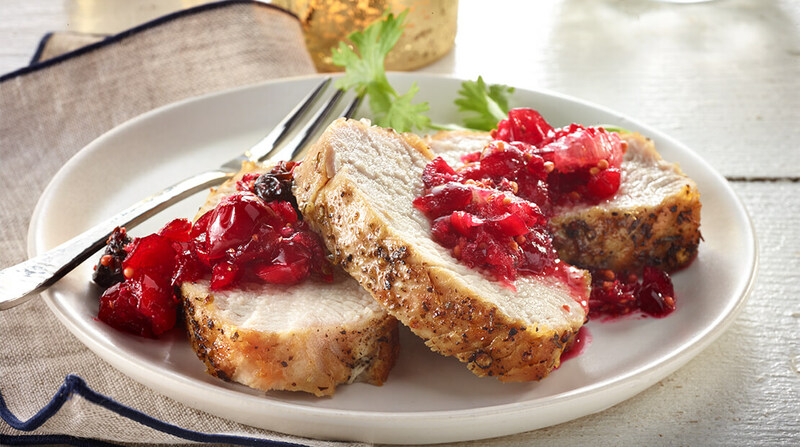 Chef Amy’s Shaken Cranberry Mostarda flavorfully complements Jennie-O® turkey tenderloin or an Always Tender® pork loin. Its also a delightful snack straight out of the jar. Prepare turkey tenderloin according to package directions. 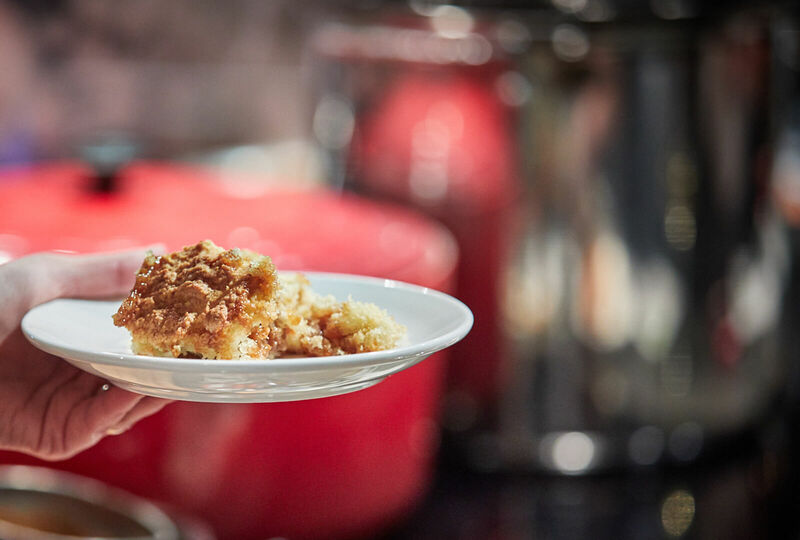 Serve with Shaken Cranberry Mostarda. Make the mostarda at least 12 hours and up to 1 week ahead: Pour sugar into a food processor and shave 5 wide strips of lemon zest (just the yellow peel, not the pith) over the top. Process until the lemon zest is reduced to bits and pour sugar mixture into a bowl. 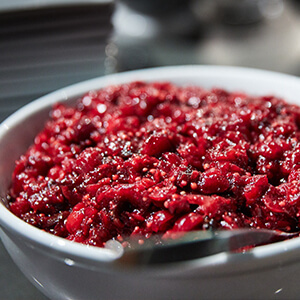 Add cranberries to the food processor and pulse until the cranberries are broken up but not pulverized; leave it coarse. In 1-quart glass jar, combine cranberries, lemon sugar, brandy and prunes. Peel pith and remaining skin from lemon and dip your paring knife between the segments to free the lemon flesh. Chop lemon flesh roughly and add to the jar. Shake the jar, turning it upside down to incorporate the sugar. In another hour, shake and turn the jar upside down again, repeating every few hours until no sugar remains and the cranberries glow bright fuschia. After 8 hours, add ground mustard seed, whole mustard seeds, vinegar and olive oil. If using that day, leave to macerate at room temperature. Stir to combine and serve at room temperature (thinning to the correct consistency with water if desired). Refrigerate any leftovers for up to 2 weeks. It’s pretty obvious that if you’re only cooking for a couple people, a tenderloin makes more sense than an entire 15-pound turkey. However, we find that sometimes an entire turkey doesn’t stretch as far as expected when it comes to leftovers. You know the scene: three days after Christmas, the whole family decides they want open-face turkey sandwiches, piled high with white meat, only to find all the best meat has been nibbled away. Don’t panic, nobody needs to go without! Just pop a turkey tenderloin in the oven, and minutes later, you have hot turkey sandwiches for everyone. 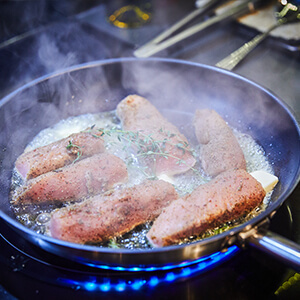 Always Tender® pork loins cook up beautifully in only 30 minutes. You can easily oven-bake or grill it over medium heat. Dry cider is just tart enough to balance the richness of roast pork or turkey. 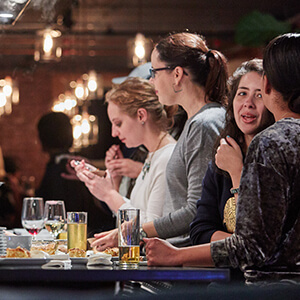 Effervescent and apple-kissed, it’s as festive of a beverage as French champagne – and much more reasonably priced, which matters if you’re feeding dozens. It also works well in many dessert recipes. Pour the apple cider into your widest skillet over medium-high heat and reduce the apple cider down to 2 cups, testing for volume as you go. (It will take about 15 minutes.) When the cider has reduced to 2 cups–it should taste sweet and tangy and look one shade darker than before–add brown sugar, cream and whiskey. Stir to combine. Pour the liquid mixture into the bottom of heavy 9 x 12 (4-quart capacity) baking dish. For the batter, in large bowl, combine melted butter and sugar. Whisk until the mixture turns pale yellow. Add eggs one by one and whisk until fluffy—it should have the consistency of frosting. (You can do this with a hand mixer, but I think it’s faster with a large bowl and a balloon-shaped hand whisk.) Add sour cream and whisk to combine. Knock off the whisk and switch to a rubber spatula. Whisk flour before measuring. Combine flour, baking soda, baking powder and salt in medium bowl and whisk to combine. Add flour mixture to butter mixture all at once and stir swiftly, mixing until just combined. 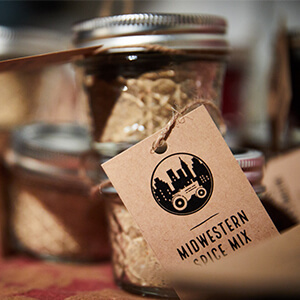 From homemade Ranchero sauce, to Midwestern sausage spice mix or coriander pesto, go for savory gifts this season. These flavors are more memorable, and they have longer shelf life than cookies. Fit the grinder attachment of mixer with the fine plate. Freeze pork 30 to 60 minutes, or until the cubes firm at the edges. Feed cubes of pork into the grinder. Combine ground pork, eggs, finely ground peanuts, garlic, cooked rice, milk, green onions, cilantro, salt, pepper, cumin, and cinnamon. Mix with hands until combined. If loose, add a bit of fine bread crumbs to firm up. In wide stockpot, heat ranchero sauce, adding a little water if necessary to thin. 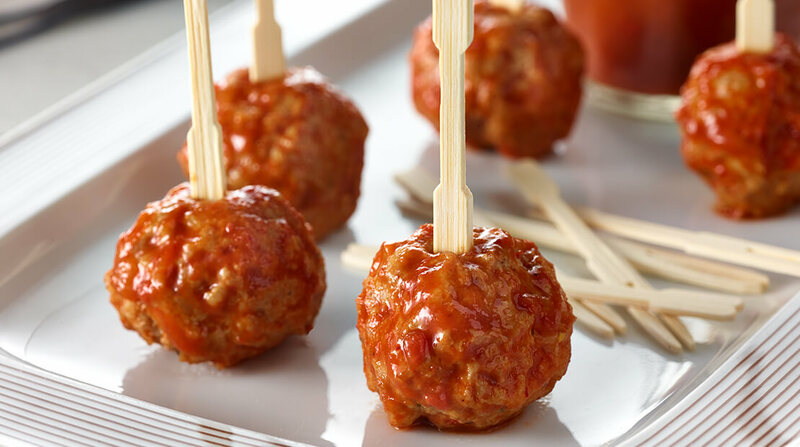 Form the pork into small meatballs and drop into sauce. Cook gently, shaking the pan to cover the meatballs with sauce. Cook 15 minutes or until the ranchero sauce thickens and the meatballs are cooked through. Serve the meatballs on slices of avocado and garnished with a cilantro leaf, if desired. Makes approximately 50 small meatballs. Remove the tops and most of the seeds from the dried chiles. Place them in a small bowl and cover with boiling water. Let steep until cool. Toast garlic cloves, in their skins, in a dry cast iron skillet over medium heat until brown in spots. Cool and peel. Toast the cumin and clove in the skillet until fragrant. Mash in a mortar until fine (or use a spice grinder). Heat a film of canola oil in the same skillet and quickly brown the onion on both sides.Place the chilies, spice mix, garlic and onions and a few tomatoes in the blender. Blend on high until smooth, and push through a sieve into a large pot, pushing on the sieve with the back of a ladle to extract liquid. Place the pulp back in the blender for another go-around. Top with tomatoes and blend at top speed until smooth. Strain again, this time discarding the pulp. Blend the rest of the tomatoes until smooth, pouring them into the pot without straining. Add the salt, sugar, cinnamon stick, and vinegar, and cook at a simmer for about 1 hour, or until the sauce thickens and no longer separates. Ladle the sauce into sterilized glass jars, top with sterilized lids. Process the jars in a boiling water bath, counting from the time the water returns to a boil: 15 minutes at 0 to 1,000 feet altitude, 20 minutes at 1,001 to 6,000 feet, and 25 minutes at an altitude of 6,000 feet or greater. Yields: 4½ pints.